The fact that Georgian deceptive drinking glasses existed at all gives credence to the little-known and rarely evidenced Georgian tendency towards temperance and moderation, not something usually associated with the gentlemen of the time, particularly where social gatherings were concerned. However, it should be noted that such uncharacteristic reserve when it came to the consumption of alcohol was not expected of the majority of attendees at functions, and these glasses were the preserve of the toastmaster at the dining table, or perhaps the host at slightly less exalted, rather more informal informal gatherings. Their purpose of these deceptive glasses was simply to decrease the amount of alcohol which could be accommodated in a vessel which was ostensibly the same size as those being used by all the other diners, thus giving the appearance that those who were charged with their use were enjoying proceedings to the full, but still being able to maintain at least a semblance of control of their faculties while all around them fell prey to the inebriating effects of whatever liquor may be available. The use of thickened glass to the base or sides of the glasses reduced the capacity of the receptacle, less drink was taken with each freshly charged toast, and the person leading the festivities for the guests was able to do so with a relatively clear head, ensuring that he was able to call for glasses to be refilled on a regular basis. Designs tended to be fairly simple - and sturdy - to make the glasses more durable and better able to last the course during increasingly rowdy proceedings. Decoration seemed to be at a premium - the glasses were functional rather than decorative - with simple sliced cuts or facets being about as ambitious as their embellishments tended to get. The stems occasionally merited more work, with a small number of knopped pieces cropping up once in a while and - less frequently still - air twists being employed to enhance pieces. It is therefore the general form with the use of thickened glass which identifies this type of glass as being of a certain type, but this does not detract from them making up an eminently collectable category of Georgian glassware. 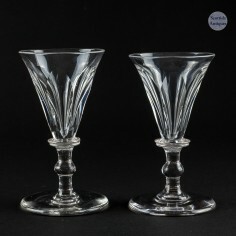 Antique gin glasses can be found alongside a wide range of fine and rare antique drinking glasses on our scottishantiques.com online store.